On June 7th, 2016 my wife and I lost our beloved cat Gateway. She first came to my apartment on June 1st, 2012. The same day Johan Santana threw a no-hitter for the Mets. It was also the same night I woke up with puffy eyes and congestion because I was severely allergic her. But, from that day on Gateway would forever be my fatty and loving cat. I didn't really like cats until she came into my life. Now I think cats are awesome and I'm glad we were able to give her a loving home during the last years of her life. We miss her everyday. 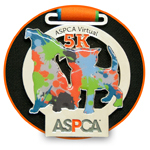 That's why this June, I will be participating in the inaugural ASPCA Virtual 5K! I am excited to be participating and honored to be raising the awareness and the much needed funding to support the ASPCA's programs. Your donation will help the ASPCA provide life-saving programs and services to millions of animals nationwide. The ASPCA is very important to me and I appreciate your help as we fight to give abused and homeless animals a second chance at life. Please support me by making a donation and help me make a positive impact in the lives of animals! Thank you!